Through experience we know that a well maintained boat will offer more enjoyment and longevity. 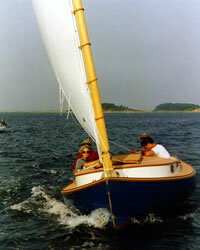 When looking around any New England harbor you will always find a Beetle Cat, either at her mooring or out sailing. Many of these boats have been sailing for twenty-five years or more and have proven to be a valued investment. Steve Smith managed the Beetle Cat shop before opening his own boat shop in Eastham, Cape Cod Massachusetts.